Gone are the days when we used to live in communities where we know our neighbours from childhood. In this day and age where people are usually grouped by their financial status and place of work, it is important to foster ways that will nurture a sense of community spirit. Start with your yard by using the following tweaks to create a neighbor-friendly yard. A fence sends the message that you do not want non-family members or non-loved ones in your space. By making your fence lower or by setting it back a few feet from the sidewalk, you create a more open space on your front yard. You can use this space to house interesting plants, a bench for a seating area, or some of the suggestions that we’d be tackling next. A tree or a group of trees will shade your sidewalk and create a pleasant environment for neighbours to drop by. Are you aware that a tree do not only provide protection against the sun and rain but can also make your sidewalk be 5 to 15 degrees cooler than the un-shaded street? Even a small yard can look warm and inviting by using plants with different textures. 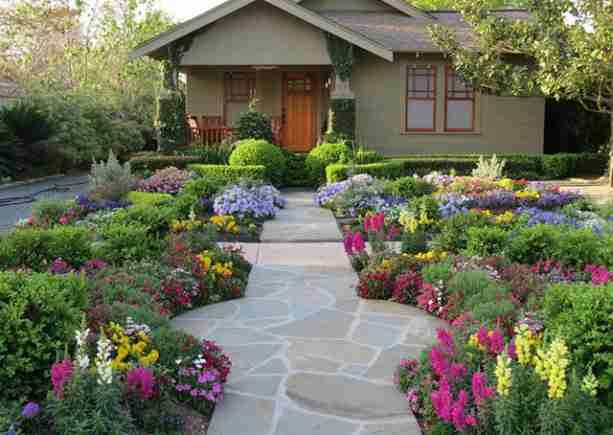 Even better if you throw in some flowering plants in the mix or use local plants that people can easily identify with. The last thing you would want is for your home to be known as the gloomy house in the neighbourhood. You can make your front yard as inviting as possible by installing lights that make your front door stand out and provide people with a sense of safety when walking by your home at night. Whether you choose to add a bench in front of your home or make your porch more sociable by installing social seating, just having something where people can sit down will not only make them visit but also send out the message that they are welcome to stay. Creating seating is one thing; it is a whole new ball game to create a hangout area. A hangout space should be comfortable and protected from the elements. For this reason, a nook nestled amongst big trees or an area of the porch with seats and cushions would be ideal. The funnel effect is the term used to describe showcasing your front door by creating an easily visible path or stairway leading to it. Note that the use of wide steps for your stairway that can double as seating and that the use of colour contrast for your pathway will lead to best results. Looking for a Toronto Town with a strong community spirit? Take a look at the various Oakville neighbourhoods. Oakville is a Town that both children and adults will surely feel at home at. Contact us if you’re interested in finding your dream Oakville home!